For everyone interested in the arts. A great way to keep in touch with the exciting local arts scene and gain access to exclusive benefits. Only £5.00 per month. Half-price membership for each additional family member. If, like us, you love Ilkley and love the arts, and want to make a difference to create a vibrant community for everyone, then please support Ilkley Arts by becoming a member of the Arts Hub. You can enjoy exclusive discounts and events as well as being able to contribute to and support our work and the development of the Arts Hub. Members forum, featuring inspiring talks, sharing of ideas, networking and topical discussions. 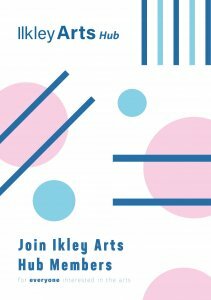 Ilkley Arts is a registered charity whose aim is to promote and celebrate the arts by supporting artists and making the arts accessible to young people, visitors and the wider Ilkley community. Additional family member living at same address half-price. 20% discount to for students in full-time education. Are you a UK taxpayer? As we are a registered charity, your membership qualifies as a charitable donation. You can Gift Aid your membership donation and Ilkley Arts receives an extra 25% from the Government. If you are a higher rate taxpayer, you can also claim additional tax relief on your donation. Why not think about buying the membership as a gift for an art loving friend, partner or family member.